Texas Tech University prides itself on being a major comprehensive research university that retains the sense of a smaller liberal arts institution. Although enrollment approaches 25,000, Texas Tech students boast of one-on-one interactions with top faculty and an environment that stresses student accomplishment above all else. 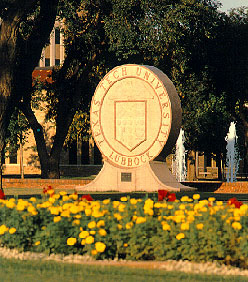 Founded in 1923, Texas Tech is located in the South Plains of West Texas. It carries the distinction of being the largest comprehensive higher education institution in the western two-thirds of the state of Texas, and serves a region that is larger than 46 of the nation's 50 states. Texas Tech is the only campus in the state that is home to a major university, law school and medical school. Students benefit from this by being offered degree programs that combine the assets of these outstanding institutions. Students pursue joint degrees in medicine and business, law and public administration, civil engineering and architecture, and a variety of other programs made possible by the combination of colleges and schools on the campus. In addition, Texas Tech is a leader in providing students opportunities to participate in undergraduate research. Undergraduate students work side-by-side with renowned faculty researchers and their work is published in major academic journals and presented at conferences around the world. Undergraduate researchers have explored in vitro fertilization procedures, insecticide toxicity and the role of the brain in the function of the heart. They have also examined voting behaviors, wind engineering, the history of art and topics in literature and the humanities. Texas Tech receives more money than any other Texas Institution from the prestigious Howard Hughes Medical Institute. It also leads the state in the number of Goldwater Scholarships awarded the last seven years. The true testament of a university is its graduates. Texas Tech ex-students have been governors of three states, flown space missions, won Olympic Gold Medals, served as ambassadors to foreign countries, acted on Broadway stages, performed in operas, won Pulitzer Prizes, been educators at prestigious universities and even performed heart surgery on prominent late night television hosts. In addition, they head some of the world's largest businesses and some of the country's most successful small firms. The university and its students also provide a valuable service to Lubbock, West Texas and the state. Research at the university focuses on programs that make a difference. Texas Tech is a leader in assessing and improving the region's environmental and healthcare needs and has assisted in developing economic development plans and programs. Researchers have been pioneers in studying plant stress, water conservation, ways to survive wind disasters and methods for developing alternative energy sources. Texas Tech students come from every county in Texas, all 50 states and more than 100 foreign countries. The university offers 150 undergraduate degree programs through eight academic colleges. It also offers more than 100 master's degree programs and more than 50 doctoral degree programs. Strong programs of study in agricultural sciences and natural resources have been the tradition at Texas Tech since its beginning in 1925. Since that time, the College of Agricultural Sciences and Natural Resources has continued its dedication to providing programs of excellence in teaching, research and public service to prepare students for employment in the modern agricultural and renewable natural resources industry. Undergraduate enrollment has increased more than 16 percent since 1992 and the college is included among the 30 largest agricultural programs in the nation. The faculty is widely recognized among the nation's best in the agriculture and natural resource sciences and excel in teaching, student advising and public service. In addition to the classrooms, laboratories and design studios housed in eight buildings on the Texas Tech campus, the college also operates 900 acres of agricultural land on the campus, a 982-acre field laboratory in northeast Lubbock County, near New Deal; a 15,822-acre facility near Amarillo; and 2,300 acres for teaching and research at the Texas Tech Experimental Ranch at Justiceburg. The college also maintains a livestock arena, a meat laboratory, a landscape architecture design studio and a greenhouse/experimental garden complex for teaching and research. In addition, the college is home to the International Textile Center, known around the world for its research in natural fibers. The Texas Tech College of Architecture, incorporating highly sophisticated design and technology, has a reputation for excellence that extends far beyond state and national borders. The college's historic preservation teams are using state-of-the-art technology to provide the National Park Service with architectural drawings of national treasures including the Statue of Liberty, the Hearst Castle and the pioneer ranches of West Texas. A visitor to the College of Architecture will find students and faculty advising rural communities who need to visualize architectural and urban design alternatives for their communities, and students and faculty are working with scientists to forecast potential threats from chemical and biological disasters. The College of Architecture is a national pioneer of the five-year Master of Architecture professional degree program. The College of Arts and Sciences, with about 11,000 students and 120 degree programs, was the first and is the largest college at Texas Tech University. Consisting of three schools, 19 departments, 11 centers, and six institutes, the college provides excellence in undergraduate and graduate education and cutting-edge research in the arts; humanities; and natural, social, and behavioral sciences. Degree programs vary from theatre and dance to chemistry, from English to mathematics and statistics, from communication studies to aerospace studies (Air Force ROTC). Students with majors in the College of Arts and Sciences use their studies as entry points for successful careers in many diverse fields. Students with majors in other areas of the university may also take courses in the college, broadening their learning in the true spirit of higher education. The Jerry S. Rawls College of Business Administration offers educational programs in all areas of business, while advancing knowledge through research, community service and the development of business in the global economy. The Bachelor of Business Administration (BBA) provides a wide variety of programs and allows business students to explore and follow particular interests. The curriculum design aids the student in choosing a major, as the first two years are "pre-business," concentrating on general education requirements, and an introduction to some of the business functional areas. Upon satisfactory completion of the lower division requirements and attainment of a minimum 2.5 adjusted TTU GPA, students may then apply for a specific business major. If qualified, they can also pursue a double major, add a minor, enroll in one of the dual programs that the college offers with architecture or agricultural economics, be in the 150-hour program which begins a master's program while still an undergraduate, or work toward a joint degree with the Law School or the Medical School. The Executive Education Division of the college develops and manages seminars, conferences and training programs for professionals and managers in business, government and industry. The College of Education is one of only 10 educator preparation programs of the 69 in Texas to be nationally accredited through NCATE (National Council for the Accreditation of Teacher Education). Currently, over 1,355 students are enrolled in two undergraduate, twelve masters and seven doctoral programs. College faculty members secure important extramural funding, provide leadership to diverse organizations and associations, and are recognized nationally for a wide range of scholarship. The College of Education prepares teachers, counselors, principals, superintendents, administrators and diagnosticians for public and private school employment. It is home to the Virginia Murray Sowell Center for Research and Education in Visual Impairment, and the Center for the Integration of Science Education and Research. The new 85,000 square foot College of Education Building is being constructed on 18th Street between the architecture and foreign language buildings and is scheduled to open during the summer of 2002. The College of Engineering is known for its Wind Science and Engineering Center, the Semiconductor Product Research Center, the Plasma and Pulsed Power Research Center, the strategic research alliance with NASA, and alternative fuel research. It brings in 51 percent of all research dollars for the university. Students in the College of Engineering have tremendous opportunities to work in laboratories with cutting edge researchers in many prominent fields of research. To date, the college has raised $45 million for scholarships and departmental support in both monies and gifts-in-kind. The College of Engineering is made up of eight departments. In the last two years, the college has seen a 50 percent increase in freshman enrollment, the largest growth for the college in 10 years. The Texas Tech University Honors College offers special academic and extracurricular programs and opportunities for highly motivated and academically talented students who want to maximize their educational experiences. The Honors College is available to serve the interests of students from all disciplines and is dedicated to examining life and society and to serving its participants through unusual classes, challenging reading, wide-ranging discussions and stimulating instruction. The Honors College provides exceptional undergraduate opportunities and personalized attention within the vast resources of Texas Tech, including financial support through merit-based scholarships and opportunities to interact with similarly motivated students in academic and extracurricular activities. Students also gain access to special residence halls, extended library privileges and in some cases, early admission to graduate or professional programs. The College of Human Sciences is among the largest academic units of its kind in the United States, enrolling more than 2,300 students. The college's academic programs are nationally accredited and include nine bachelor's, seven master's, and five doctoral programs that prepare graduates to be scholars and leaders in business, government, community and educational settings. Areas of study include early childhood; family financial planning; fashion design; food and nutrition/dietetics; human development and family studies; interior/environmental design; merchandising; restaurant, hotel, and institutional management; family and consumer sciences education; marriage and family therapy; and courses in addiction studies. The college's economic development initiatives include the Texas Wine Marketing Research Institute, the Center for Financial Responsibility, and research with tourism, beef, textiles, and other agricultural products. Community outreach programs include the Center for the Study of Addiction, the Center for Financial Responsibility, the Family Therapy Clinic, Transition to Seventh Grade, the Parent Empowerment Program, Parents as Teachers, Early Head Start and welfare to work programs in hospitality. The achievements of the Texas Tech University School of Law are as varied as the students, faculty and graduates who make up the school. The Law School achieved a 100 percent passage rate among students who took the state bar exam in February 2000. It was the first time since 1983 that any one law school in Texas has had a perfect passage rate. Diversity also is increasing at the School of Law, as enrollment of women and minority students has exceeded the expectations of the administration. Two Texas Tech University School of Law students brought home a National Championship trophy from the Sojourner Truth Moot Court Competition. Texas Lawyer named W. Frank Newton, dean of the law school, as one of the 102 most influential Texas lawyers of the century. One faculty member, Tim Floyd, J.D., served as defense counsel in the first case in the nation under the Federal Death Penalty Act of 1994, which was heard by the United States Supreme Court in February 1999. Another faculty member, Daisy Floyd, J.D., was selected in 2001 as a Carnegie Scholar by the Carnegie Academy for the Scholarship of Teaching and Learning, a project of the Carnegie Foundation for the Advancement of Teaching; she was one of 30 faculty members selected from various institutions of higher education throughout the nation. Many other student team awards and faculty recognition continue to enhance the national reputation of Texas Tech's School of Law. Texas Tech University's Vietnam Center and Vietnam Archive represent the largest collection of Vietnam-related documents outside of the federal government. The archive currently is engaged in a multi-year, federally funded project to put the entire collection on-line to assist researchers worldwide. The center hosts annual conferences and symposia, attracting participants from around the world, to examine issues relating to Vietnam, Southeast Asia and the Vietnam War. Additionally, through the history department, undergraduate and graduate courses offer students the opportunity to study all aspects of the American Vietnam experience. World renowned Vietnam scholar Professor Douglas Pike is an associate director of the center and publishes a quarterly journal of contemporary events in Vietnam, entitled Indochina Chronology. For further information on the Vietnam Center and Vietnam Archive, check their web page at http://www.ttu.edu/Vietnam. In 1997, Texas Tech made a major commitment t environmental science with the establishment of The Institute of Environmental and Human Health. This interdisciplinary research program brings together scientists from the university and the Texas Tech Medical Center to address important issues involving the long-term effects of toxics on the environment and on humans.